The Carbon Art speed boards are one of the fastest boards I have ever ridden. But why are these boards so easy and fast... They are made for gps-speedsurfing or 500m outright, but also comftable to go racing in ocean swell. Fact: I know just before I bought the CA speed 44 and 50 they promised me to be overall 10kmh faster in one year... and to honest it was true! This board has unlimited topspeed, the only thing that will stop you is the drag from your fin. Tapered Parallel outline maintains a smooth and free ride through chop when combined with flatter overall rocker, providing a stable platform that doesn't bounce around when the conditions get tough. Thinned back foot area keeps you closer to the fin, which gives you more direct control and reduces back leg movement in chop. Volume centred further forward for maximum sub-planing stability and easy waterstarting. 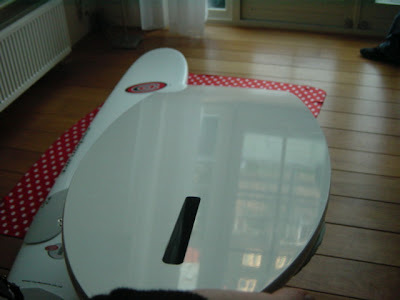 Thicker rails help to produce more buoyancy for the volume of the board than conventional shapes. Gybing is tight and fast due to the pin tail and V distribution. Flatter rocker gets the board planing fast, and makes it easy to sail upwind. All of these features save energy so you spend more time going fast and less time taking a breath on the beach! The CA speed 50 is in the same range as the bigger brands speedboards, only the CA does have 20 liters extra! I know for sure that carbon art is one of the best manufactors of windsurfboards. They have very tight tolerances, if you order one you actually get the same board as I am using, same as the very fast Chris Lockwood! Just to honest big brand boards from cobra factory have big tolerances... Don't think that Antoine Albeau just picks one SB Isonic out of the bunch. Also the CA speedboards are quite crashproof, to be honest I don't crash often, but when it goes wrong... They are still in 1 piece and still the same shape after 1 year of abuse. Carbon Art Boards do have an comftable stance, the masttrack and footstraps are very well placed for normal surfers. It is very comfy to go fast. The CA Speedboards are one of the very less boards that I use all day without getting tired. Taking this board to the limit is not physical at all.